One of the great new features in Photoshop CS6 is the improved and enhanced Crop Tool. If you've been using earlier versions of Photoshop to crop your photos, you'll find quite a few changes with CS6, all designed to make cropping and straightening images easier and more flexible than ever before. In this tutorial, we'll learn how it works! 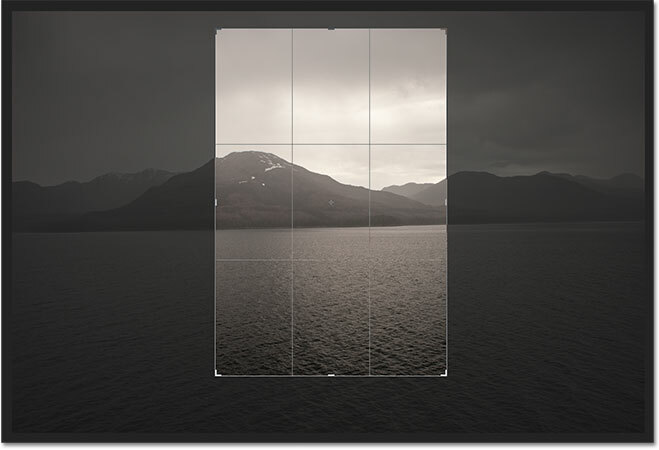 Photoshop CS6 automatically places a crop box and handles around the image. 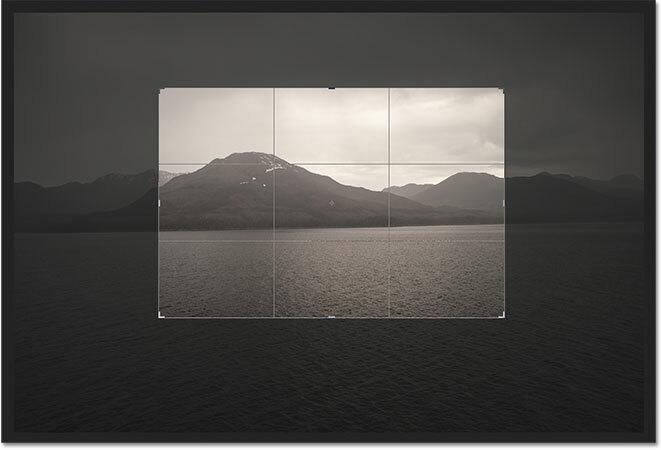 Click and drag the handles to resize the crop box. One thing to note before we continue is that you don't necessarily have to use the initial crop handles that Photoshop CS6 places around the image. They're added purely for convenience. Just as in previous versions of Photoshop, you can also click anywhere inside the image with the Crop Tool and, with your mouse button held down, drag out your own crop box which you can then resize and reshape by dragging any of the handles. The choice is yours. 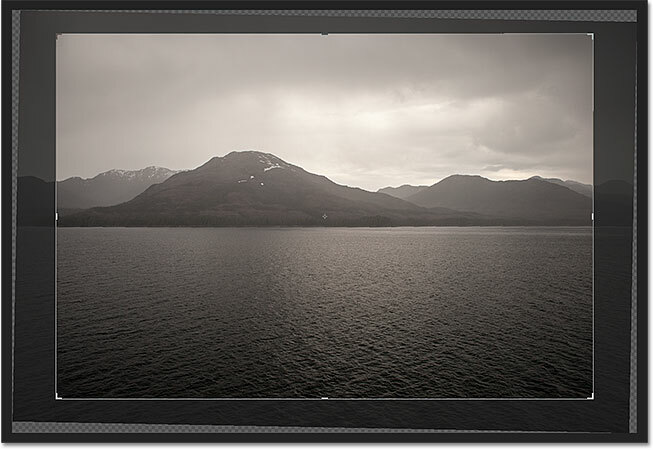 You can choose from any of the preset aspect ratios. 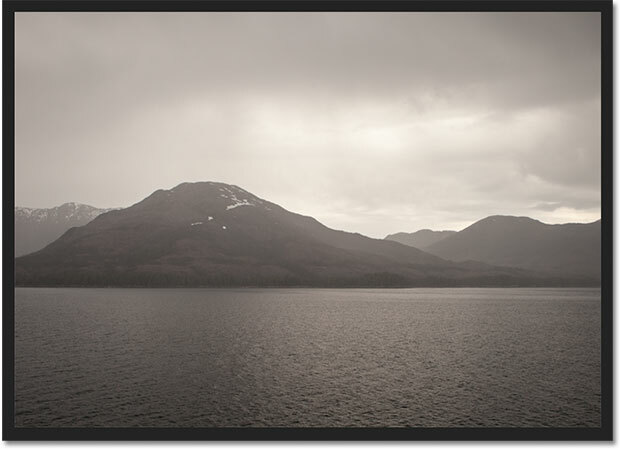 The crop border has snapped to a 4x3 aspect ratio. 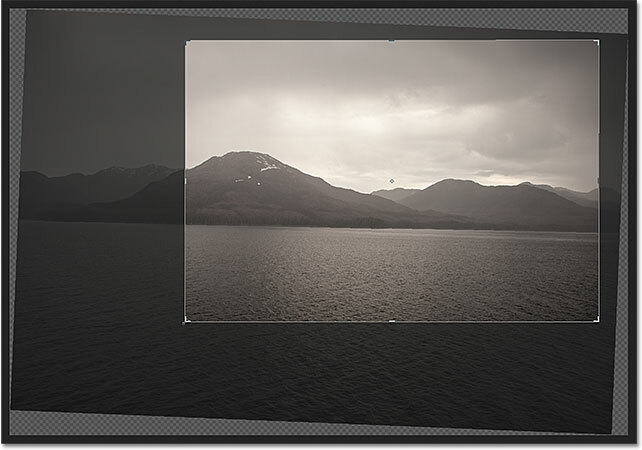 Enter your own custom aspect ratio values if needed. Click the Rotate button to switch between Portrait and Landscape mode. The crop border has been rotated from landscape to portrait orientation. Click and drag the photo around inside the crop box to reposition it. You may have noticed in the screenshots that a grid overlay has been appearing inside my crop box. 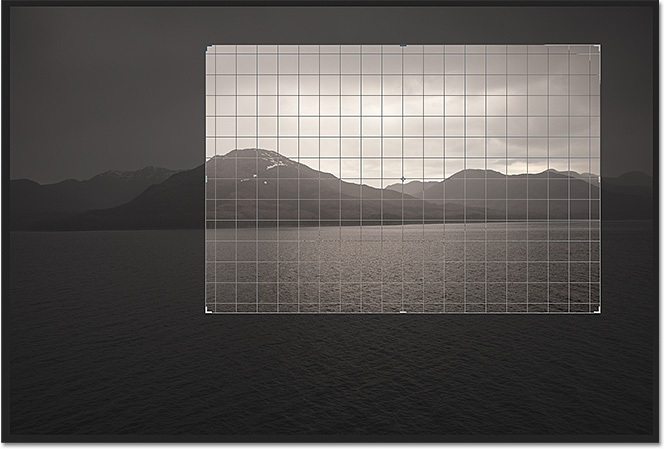 By default, Photoshop CS6 shows us a 3x3 grid known as the Rule of Thirds, which states that when cropping the image, you should place the main subject of your photo at one of the spots where the horizontal and vertical grid lines intersect. Of course, that's just a general guideline that may or may not work well with your particular image. The View option in the Options Bar. Choosing a different overlay from the View menu. 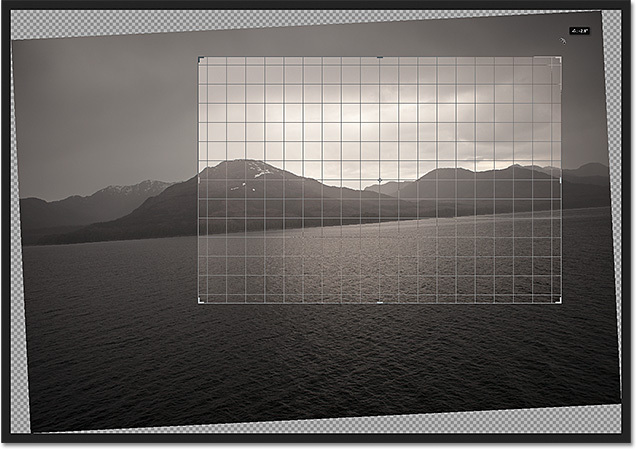 Photoshop CS6 gives us several overlays to help with cropping and positioning the image. Photoshop CS6 lets you choose when, or if, you want the overlay to appear. Click and drag anywhere outside the crop box to rotate the image. Click and drag along something that should be straight in the photo. Photoshop straightens the image when you release your mouse button. The Reset button resets the crop box, rotation and aspect ratio. Click the Cancel button to escape out of the image cropping. The new Delete Cropped Pixels option in CS6. Selecting this option by clicking inside its checkbox will permanently delete all of the pixels you crop away. That may sound like what you'd want, but this is known as a destructive edit because it makes a permanent, physical change to your image, something you want to avoid whenever possible. A better, more flexible and non-destructive way to work is to leave the Delete Cropped Pixels option unchecked. That way, Photoshop will keep the cropped pixels and simply hide them from view, allowing you to go back and make changes to your crop at any time! We'll see what I mean in a moment. 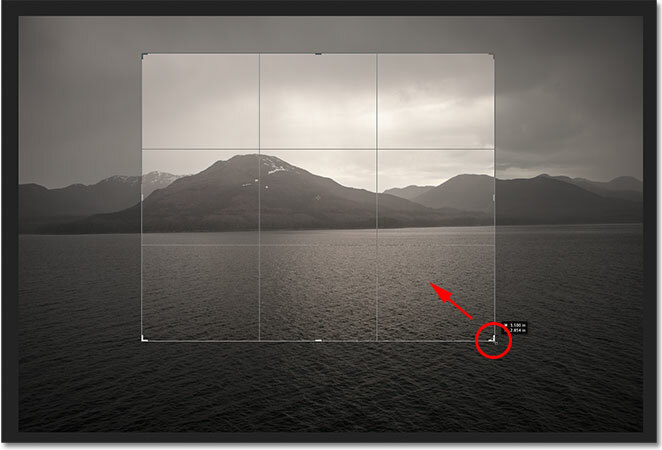 Click the checkmark to apply the crop, or press Enter (Win) / Return (Mac). The photo has been cropped, but the crop box and handles are still visible. To hide them and view the image on its own, all we need to do is choose a different tool from the Tools panel. The quickest way to do that is to press the letter V on your keyboard which will switch you to the Move Tool, and now the crop box and handles are no longer visible. Select a different tool to hide the crop box and handles. 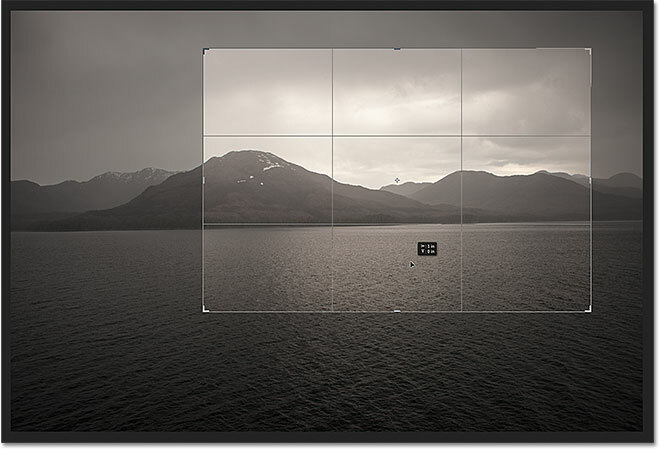 Re-select the Crop Tool to edit the crop at any time. And there we have it! That's how to crop and straighten images using the new and improved Crop Tool in Photoshop CS6! Check out our Photo Retouching section for more Photoshop image editing tutorials!